Join us for a new, “pop-up” book discussion group, The Future is Female, focused on timely and diverse memoirs by insightful and inspiring women. Led by Ellen O’Connell, the group will meet on the first Monday of every month, from 2-3:30 p.m., in the Community Room. March 4: I Am Malala: The Girl Who Stood Up for Education and Was Shot by the Taliban by Malala Yousafzai. An urgent message about the untapped power of girls. April 1: My Life on the Road by Gloria Steinem. Looks back at five decades as a feminist organizer and leader. May 6: Year of Yes by Shonda Rhimes. The creator of Grey’s Anatomy, Scandal, and more details her year of saying yes to all that scared her. June 3: Lab Girl by Hope Jahren. Told through a personal lens, this book will open up how you see the natural world. 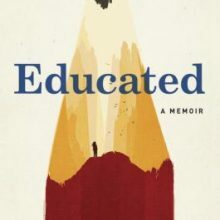 July 1: Educated: A Memoir by Tara Westover. Kept out of school by her survivalist family, the author’s quest for knowledge eventually takes her to Harvard and Cambridge. I definitely want to participate in this group. I am retiring in March and hope to attend the 4/1 discussion. We look forward to seeing you there, Joanne. I will definitely try to be there for the March 4th meeting.. Thank you! I would love to participate in this group! I am an avid reader and truly enjoy memoirs by women writers. I work from 7:30 to 3:00 every day, however. Maybe I will try to leave early for one or two of the meetings coming up this spring. I am retiring in July. Will the Book Group still be meeting after July? Hi Cathy, definitely stop by if you can. As for after July, I don’t currently have confirmation. I believe we might skip the fall as we may have some other new book groups starting up at that time.